Mom Central and Ragu sent me 2 pouches of their new Ragu sauce to try out on my family. We love to eat noodles, and spaghetti sauce is a staple in our pantry. Even though there are 5 in my family, we're not all big sauce lovers. My oldest son LOVES noodles, but doesn't like any tomato sauce. My middle child likes to eat noodles with or without sauce. My youngest would make a huge mess, so I avoid sauce on hers at the moment. My DH likes a lot of sauce. I prefer just a light tossing of sauce. SO, I was excited to see that these pouches have 3 servings of sauce in each package. That seemed like just the right amount for my family! Usually, we open a jar and have it for 2 or more meals. There are 3 flavors -- Garden Veggie, Tomato Basil and Tomato, Onion & Garlic. We tried out the Garden Veggie and Tomato Basil. The package directions state that it takes 90 seconds in the microwave, and I found that to be true! I was afraid there might be some tomato splash in the microwave, but there was none. The flavor was good, and not any different than the traditional sauce sold in glass jars. The amount was perfect for my family. I didn't have to dirty a pan, because we poured the sauce from the package onto the noodles. It saved a few minutes of preparation and clean-up, which is always nice in a busy household! The Ragu website has some quick meal ideas listed which gave me a new idea for rotisserie chicken! We tried it for our 2nd pouch and I know that I'll make it again for my family. The pouches have about half the sauce as the glass jars, but seem to cost the same. 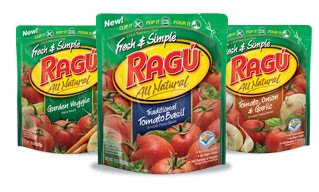 Ragu was on sale at a local grocery store this week for 3 / $5 -- for both the jars and the pouches. I have to admit that I bought the glass jars since it meant I will prepare 2 meals for the same price as one pouch. My other issue is that the pouches seem completely un-recyclable. Glass jars can be reused for various purposes and also recycled in certain areas. These pouches are strictly one use items. I think the extra cost could be justified if they could figure out a recyclable package. Except for those drawbacks, I enjoyed trying out this new product. I think I will use it in my "new baby dinner baskets" for small families. I may also put a few in my sister's Christmas stocking next Christmas (she lives alone and would never get through a full-size jar!) If the price is right, I will throw a couple in our pantry as well for those desperation nights when I need to put dinner on the table in the absolute fastest amount of time possible. Thanks for these reviews, we are now using a couple of products we learned about from your blog - like that clorox green cleaning stuff [which I really like!]. Just wanted you to know you are being very helpful to others!